I will start off this review and say that if you haven't read the first book in this series yet, Shadow and Bone, please do. You're missing out big time. I fell in love with Alina's story and her struggle with the Darkling and her powers. It all created this epic adventure that was hard to put down. While I like Alina's character, she actually got a bit on my nerves in this one! It's not necessarily a big deal, but it definitely created some conflict in the story and made me have the desire to pull out my hair. Like I said, no biggie. However, she still was stubborn and determined as ever, making rash decisions and trying to save all of Ravka. If you don't admire this character, there is something possibly wrong with you. Also, she's got some great snark. I loved it. You don't know how excited I was to jump back into this story. I got it in the mail and I read it as soon as I possibly could. 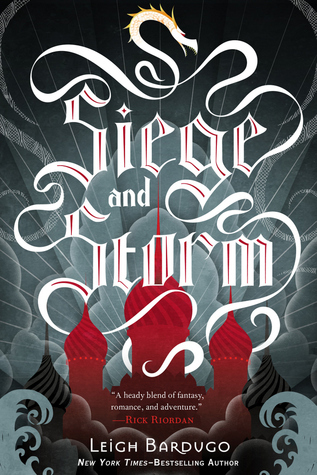 While I think I like the first book better, Siege and Storm did not let me down in any way. There was always plenty of conflict to keep me interested, whether it be romance or saving Ravka. And right in the beginning there is a major plot twist! Many new characters are introduced and Mal and Alina's relationship deepens. And I cannot count how many suitors Alina receives! But it's okay . . . maybe. Speaking of relationships! I might as well bring up Alina and Mal! I love these two together! While there is a certain alluring quality about the Darkling, I think that Alina and Mal are Meant to Be. There's something about way-back-when-friendship-turned-couple that makes my heart go all mushy. It just makes me SO HAPPY. And seeing them hurt makes me hurt, and when they're happy I'm happy. I am the commensurable reader benefiting from (or suffering from) their togetherness, an unknown presence to them, but a large part of my survival as a reader. Also, their banter was so cute to read! They had such great chemistry! And may I also bring up the subject of Bardugo's writing skillz?? They are AMAZEBALLS. Everything about it is visual, the descriptions are beautiful and thus, the wonderful and terrible world that Leigh concocted becomes real. It is magical in every way! Her writing really sets the tone. I drifter through the half-light, past the silent lawns covered in mist, the clouded windows of the greenhouse. The only sounds was the soft crunch of my shoes on the gravel path. The morning deliveries of bread and produce were being made at the Grand Palace, and I followed the caravan of wagons straight out the gates and through the cobblestone streets of the upper town. There were still a few revelers snoozing on a park bench. A group of girls laughed and splashed in a fountain, their skirts hiked up to their knees. A man wearing a wreath of poppies sat on a curb with his head in his hands while a girl in a paper crown patted his shoulder. I passed them all unseen and unremarked upon, an invisible girl in a drab brown coat. Isn't it beautiful?? Or maybe it's just because I've been reading such meh books with meh writing that going to this one clearly outshines the others. But still, I have to admit that Bardugo is a very talented author. Now, for everyone to get into the cheer for the release of Siege and Storm, I have a giveaway for you all! You know the rules: play fair and all. So, now I'll leave it up to you! No, the author has no say in what the cover of the book looks like, unless they are a self-published author--which Leigh Bardugo is not. And I'm not sure who exactly encouraged Leigh to sit down and write. I do know that she got the inspiration for this book series after she got afraid when it was completely dark in the room and she thought she was hearing things and stuff. That's how she came up with the idea for the Fold, which houses monsters. Eep, I'm so excited that you enjoyed this one so much, even though you didn't love it as much as S&B. Honestly, I doubt any book in the world would be able to live up to that book. I'm such a fan of Mal and Alina as well, and I loved their chemistry in the first book. So I'm so excited to see their relationship deepen in this sequel! And goodness, eeep for that gorgeous writing style. Can I just say I freaking LOVE Leigh Bardugo? !